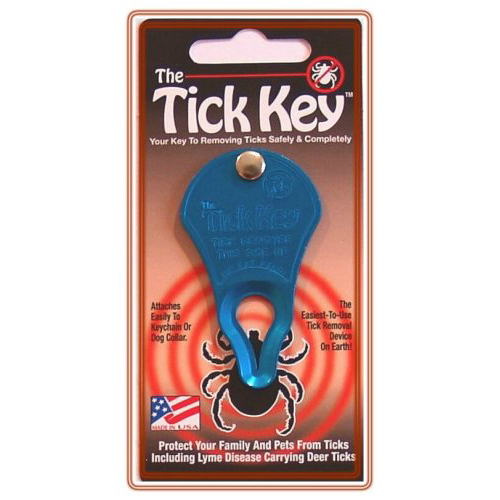 Tick Key is a perfectly designed tick remover – one of the most easiest-to-use tick remover so far. The innovative design is especially made to remove countless ticks of all sizes including deer ticks and dog ticks. This high strength anodized aluminium tick remover is made from high quality, which is durable and strong. It works best in removing the entire tick –head and all. With Tick key, you need not touch even the most engorged ticks with your fingers, because of its design. Tick key is very easy to use. Just place the key over the tick in the slot and pull key away from tick sliding along the skin. In just an instance tick is removed easily, head and all without harming your pet. Place tick key over the tick in the tear-drop hole. Slide the tick into specially tapered slot. Pull key away from the skin. Tick is removed easily, head and all. Disinfect your Tick key after each use. Keep out of reach of toddlers and pets. I love it! I didnt think something this simple would work so well but it does. It removes the tick head and all and its so much easier than using tweezers or burning and the ticks fall in the key so I dont even have to touch them! I used this for the very first time on my German Shepherd. He had a tick latched on his right leg. I used tick key and literary in seconds the whole tick came out. I have always been worried about the regular tweezers that do not get the entire tick's head out but this product is amazing. I would definitely recommend this product to other dog owners. I live in a bushy area where there is always a looming danger of ticks. But since I have started using this product on my furry pal it has made my task of removing ticks from the body of my dog simple. I would definitely recommend this product to all the dog owners!! !